In honor of National Pumpkin Day, which took place on October 26, I thought it appropriate to share the story of the Great Glass Pumpkin. 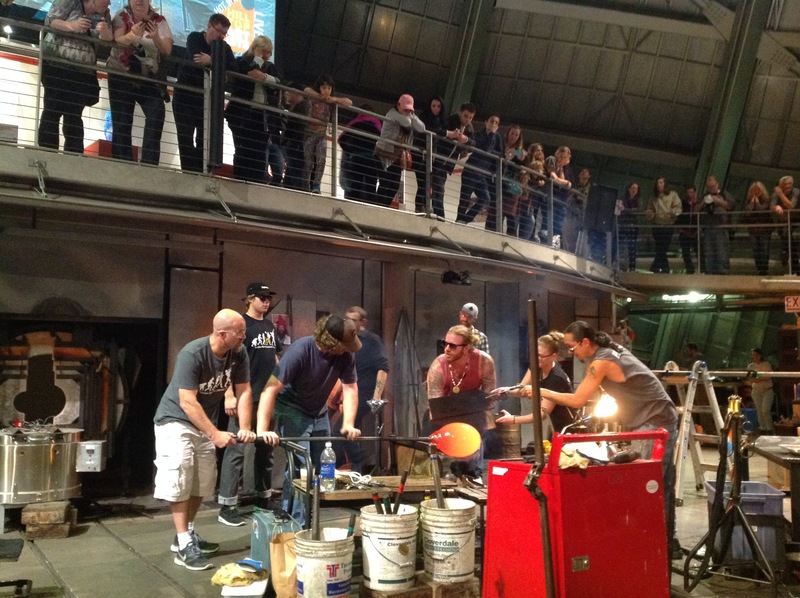 On October 15, Tacoma Glassblowing Studio and Hilltop Artists joined together in the Museum of Glass (MOG) Hot Shop to blow an enormous glass pumpkin. The much anticipated event occurred on the evening of Third Thursday, during which the Museum offers free admission between 5 and 8 pm, sponsored by Columbia Bank. The word had spread that the two teams were going to attempt this festive feat, drawing hundreds of visitors to the Museum of Glass Hot Shop. Before I dive into the making of the Great Glass Pumpkin, let’s take a quick journey to the east coast. The Corning Museum of Glass (CMOG) in New York claims the record for the world’s largest glass pumpkin, which measures 97 inches in circumference and weighs 70 pounds. It took CMOG 50 hours of work and 17 attempts to create the largest blown glass pumpkin! 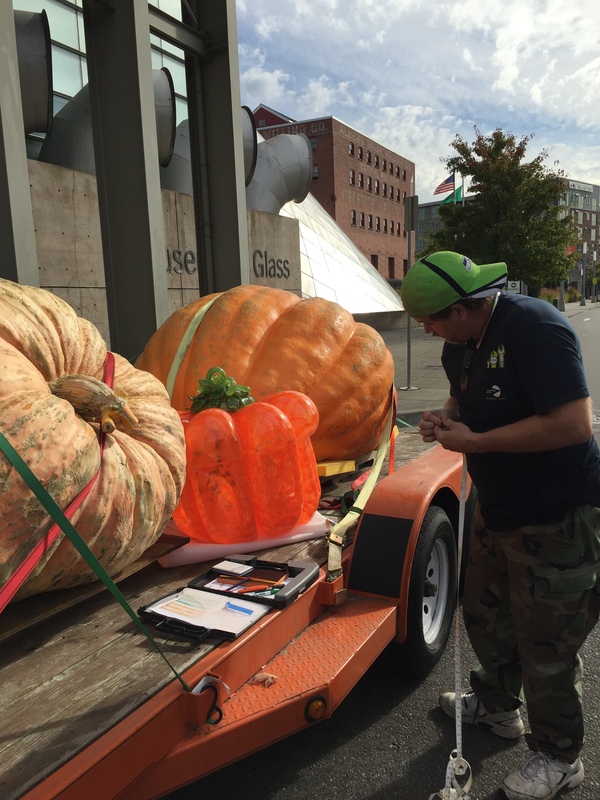 With only three hours to blow an enormous pumpkin, the Tacoma Glassblowing Studio and Hilltop Artists teams were not planning to break this record. World records aside, what the artists accomplished at Museum of Glass in those three hours was nothing short of spectacular. Glassblowing is a team sport, and due to the number of gathers (the process of collecting a mass of molten glass on the end of a blow pipe) required for the Great Glass Pumpkin, this particular event was a massive team effort. Once the mass of molten glass had been gathered and rolled in color (to make it orange, of course), the teams had to insert it into a blow mold. It was make or break. Literally. Once blown into the mold, the glass would either hold its shape or shatter once the mold was removed. To everyone’s relief (and joy!) the Great Glass Pumpkin survived. With the final touch of the stem fused on top of the pumpkin, the Hot Shop crowd roared in applause! The fun didn’t stop there. Once the Great Glass Pumpkin came out of the annealer, it was time to measure it, and who better to measure a pumpkin than an official state fair pumpkin judge? Ron Barker gets ready to measure the Great Glass Pumpkin. Ron Barker was the man for the task, and he went above and beyond in making what could have been a very quick wrap-the-tape-measure-around-the-pumpkin feel very official. Ron has traveled around Washington and Oregon measuring enormous home-grown pumpkins, and on the day of the Great Glass Pumpkin measure, he brought two of these specimens to the Museum! 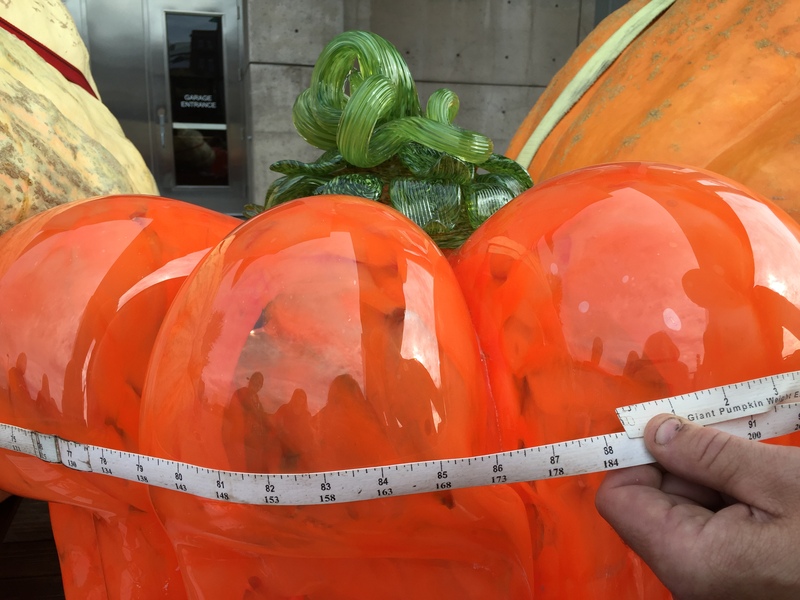 While the Great Glass Pumpkin may look small next to these enormous real pumpkins, which weigh over 1,500 pounds each, Ron’s measuring tape revealed a circumference of 88 and 1/2 inches, just under 10 inches shy of CMOG’s world record. This was truly a spectacular achievement for a glass pumpkin that was created in only three hours! Ron was also able to take enough measurements to calculate what the Great Glass Pumpkin would weigh if it were a real gourd. As a glass pumpkin, it weighs between 50 and 60 pounds, but if it were real, it would weigh a whopping 360 pounds! The Great Glass Pumpkin is on display in the Museum of Glass Store through October 31, after which it will head home to Tacoma Glassblowing Studio. Congrats to Tacoma Glassblowing Studio and Hilltop Artists on the Great Glass Pumpkin! 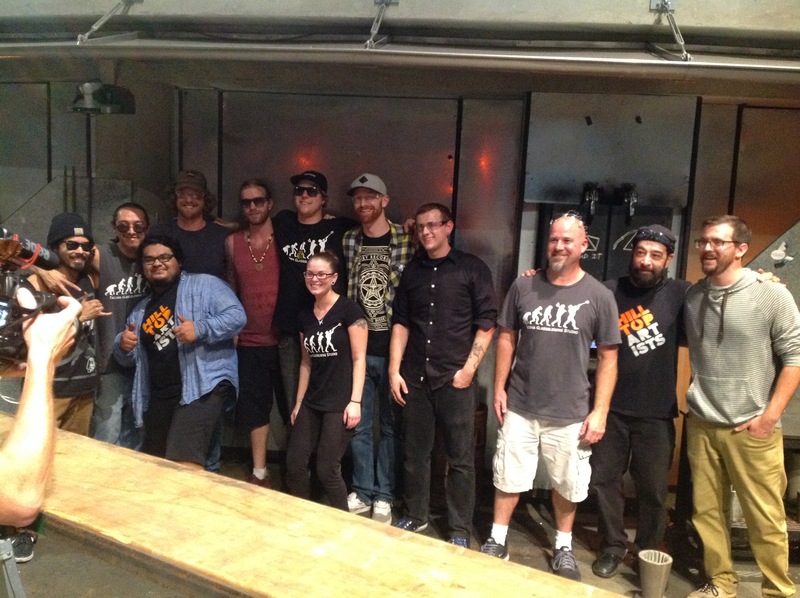 Tacoma Glassblowing Studio and Hilltop Artists teams after making the Great Glass Pumpkin. This entry was posted in Art, Events, Glass, Hot Shop, Museums and tagged Columbia Bank, Corning Museum of Glass, glass pumpkin, Great Glass Pumpkin, Hilltop Artists, Hot Shop, Museum of Glass, National Pumpkin Day, New York, Tacoma, Tacoma Glassblowing Studio, Third Thursday on October 30, 2015 by Museum of Glass.